In this French Protestant (Huguenot) Church in Charleston, South Carolina, there can be found a plaque honoring the memory of Maria Warenbuer Ferree. 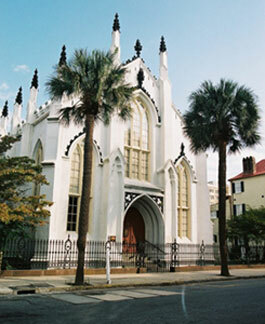 The church located on the corner of Church and Queen Streets in Charleston was founded in 1681 by Huguenot refugees. 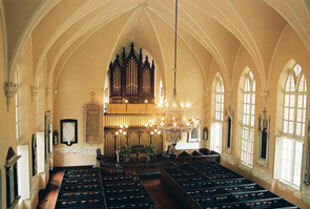 It is the only remaining independent Huguenot church in America. The original building was destroyed by fire in 1796 and was rebuilt. The present building dates back to1845 surviving the bombardment of Charleston during the Civil War and then later damage from an earthquake. More history of the church and information can be found on their website www.frenchhuguenotchurch.org. The plaque was sponsored in 1942 by Mrs. Harry Clark Bodon (Marguerite) of Newark, Delaware, with a donation of $150.00. Church files show there was some discussion with Mrs. Bodon regarding the various spellings of Warenbuer. 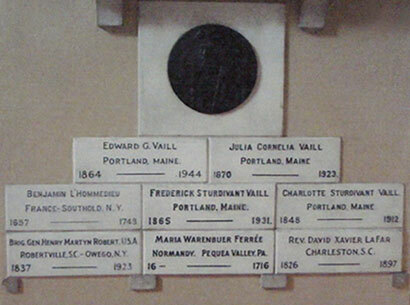 Also, because of limited spacing on the plaque it was decided to put Pequea Valley instead of Lancaster County as she had originally requested. Wording is cut into the stone except for a dash following the 16 which represents the birth date of Maria. Since that date could not be determined at the time, a dash was painted on with the thought it could easily be removed and the missing numbers stone cut at a later time once the exact date was known. Our sincere thank you is extended to the The French Protestant (Huguenot) Church in Charleston for their cooperation and to Renee Marshall, on the Board of Elders, who provided information and the plaque photos. We would also like to extend a thank you and our appreciation to Brenda LeFevre, a Ferree descendant, who brought the church and plaque to our attention. .